This Schwaiger remote control is used to operate the LED light bulbs. Depending on the functions of the individual light bulbs, this remote can be used to turn the light on or off or to adjust light intensity (brightness). In addition, it also offers the possibility of adjusting the color temperature, for example within the range of warm white to cold white, or the light color. 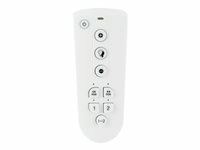 The remote control allows for operating a few LED light bulbs, either individually or in groups.